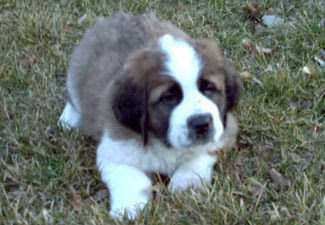 Height: Color(s): white with red, red or brindle with white; white must appear on chest, feet, tail tip, noseband, and collar ; may have dark mask Coat: The Saint Bernard breed has two different coat varieties: the smooth or shorthaired, and the rough or longhaired. Both varieties of coat are extremely dense in texture and are water resistant. Distinct features: heavy bone structure, forehead are prominent and broad and even markings are there Temperament: The Saint Bernard are excellent with children and other animals. They have a protective instinct for their family and make excellent watchdogs. They are sensible and loving and make a great family pet. They thrive on high amounts of love and attention. Activity: The Saint Bernard requires a moderate amount of outdoor exercise. It is important they do not become over-heated. They enjoy daily walks and play sessions. They are suitable for apartment living provided they are given frequent walks. They will enjoy a yard of any size but it must be securely fenced.